What is our atmosphere like? The Global heat budget and energy circulation. The world's greenhouse gas emitters. 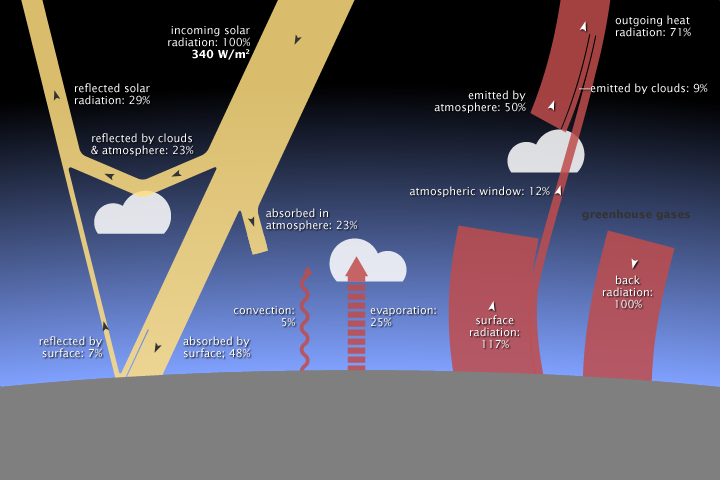 Draw up a table to contrast the characteristics of the four layers of the earth’s atmosphere. ​Why doesn’t the natural greenhouse effect cause a runaway increase in surface temperature? Remember that the amount of energy a surface radiates always increases faster than its temperature rises—outgoing energy increases with the fourth power of temperature. As solar heating and “back radiation” from the atmosphere raise the surface temperature, the surface simultaneously releases an increasing amount of heat—equivalent to about 117 percent of incoming solar energy. The net upward heat flow, then, is equivalent to 17 percent of incoming sunlight (117 percent up minus 100 percent down). An external forcing is a type of climate forcing agent that impacts the climate system while being outside of the climate system itself. External forcings include galactic variations, orbital variations, and solar variations - such as sunspots. These external forcing mechanisms can happen on relatively small time scales - around 10 years - up to extremely large time scales of 109 years. Positive forcing warms the atmosphere as more incoming solar energy (insolation) is received or the amount of radiation lost back to space is reduced. Negative forcing cools the atmosphere as less insolation is received or the quantity of radiation lost to space increases. Pressures and processes that cause radiative forcing are called forcing agents. Variations in the amount of solar energy being released from the Sun at a given point in time has been considered as an external forcing factor. However, a connection between the cycles of output from the Sun and climate cycles has not been firmly established. One of the best known solar cycles is the sunspot cycle, which takes place over a period of 11 years. From observations it has been found that at times of numerous sunspots, the value of the solar constant increases and thus solar irradiance increases with it. Changes of the solar irradiance like the ones that occur during sunspot cycles could force climate changes. Although there are measurable changes during this cycle, it is difficult to associate any observed climate change to these variations as the variations themselves are so small. Additionally, in times where sunspot cycles are less intense it appears there is an associated decrease in the Earth's temperature - however this connection is still not proven. Other solar cycles include the change in solar diameter. In addition to the planets orbiting the Sun in the Solar System, the Solar System itself orbits the centre of the galaxy, and this rotation has been noted as a possible source of external forcings. Over the course of a galactic year - 303 million years - there is some level of variation in the composition of the matter that exists in space between the stars. This variation in the makeup of space could influence the amount of solar radiation that hits the Earth. This change in solar radiation levels makes galactic variations a type of possible radiative forcing. However, it is difficult to confirm this variation as a type of external forcing because of the extremely long timescale. There are a number of different changes in the Earth's orbit around the Sun that have been investigated as possible external forcings. The overall theory of astronomical causes of climate variations is known as the Milankovitch theory, and evidence has been found to support the ideas in the theory. There are three major variations - the tilt of the Earth's axis, it's precession, and eccentricity of the Earth's orbit around the Sun. The tilt of the Earth on its axis of rotation can change between 22° and 24.5° over the course of 41 000 years (with the angle currently at 23.4°). 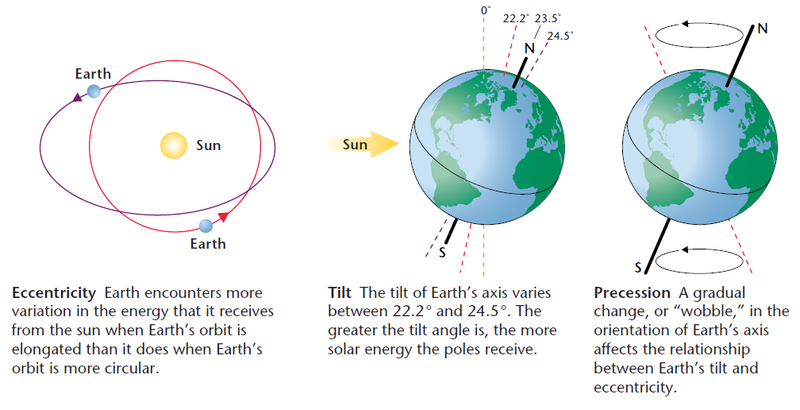 The tilt of the Earth changes how solar radiation is distributed over the Earth's surface. Although the tilt doesn't change how much solar radiation hits the Earth, the amount of solar radiation hitting a certain area differs. A change in tilt has a minimal effect around the equator, but near the poles as the tilt increases so too does the amount of sunlight that hits this area. This increase in temperature at higher latitudes can cause certain climate effects. Also, the Earth's orbit around the Sun follows an elliptical, not circular path. The strength of the ellipse or the eccentricity of it is another orbital variation. The orbit of the Earth has been found to vary between almost nearly circular (with an eccentricity of 0.005, the closer the value is to 1 the more elliptical the orbit is) to fairly elliptical (with an eccentricity of 0.06). 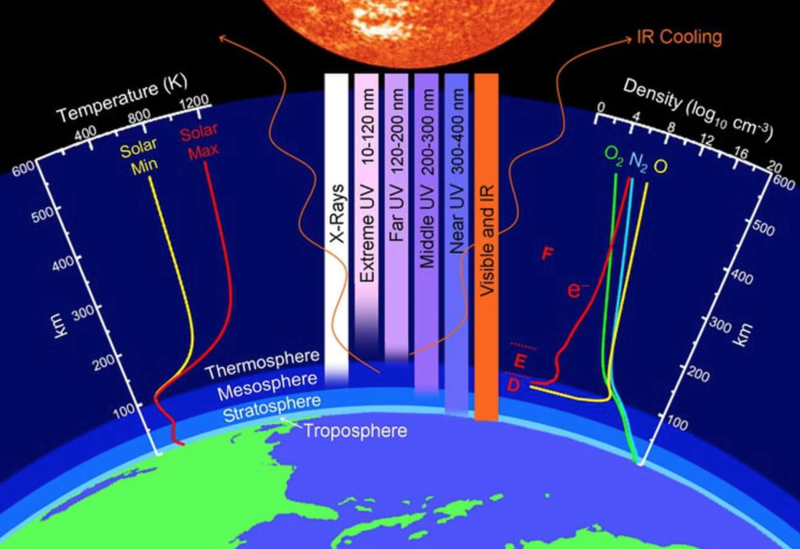 The changes in eccentricity change how much solar radiation hits the top of the atmosphere, with maximum eccentricity solar radiation hitting the Earth can very 30% over the course of the Earth's orbit. The final variation is the variation of precession of the Earth. Two components of the Earth's orbit precess - the first is an axial precession which causes the Earth to "wobble" around its own axis like a spinning top. The second is an elliptical precession where the orbit of the Earth itself shifts slightly with the point at which the Earth passes closest to the Sun changes. These changes occur over a large time scale - around 22 000 years. Similar to the Earth's tilt, precession doesn't change how much total energy is received by Earth but changes how it is distributed over time. ​Explosive eruptions can inject large quantities of dust and gaseous material (such as sulphur dioxide) into the upper atmosphere , where sulphur dioxide is rapidly converted into sulphuric acid aerosols. Whereas volcanic pollution of the lower atmosphere is removed within days by the effects of rainfall and gravity, stratospheric pollution may remain there for several years, gradually spreading to cover much of the globe. The volcanic pollution results in a substantial reduction in the direct solar beam, largely through scattering by the highly reflective sulphuric acid aerosols. This can amount to tens of percent. The reduction, is however, compensated for by an increase in diffuse radiation and by the absorption of outgoing terrestrial radiation (the greenhouse effect). Overall, there is a net reduction of 5 to 10% in energy received at the Earth's surface. Clearly, this volcanic pollution affects the energy balance of the atmosphere whilst the dust and aerosols remain in the stratosphere. Observational and modelling studies (e.g. Kelly & Sear, 1984; Sear et al., 1987) of the likely effect of recent volcanic eruptions suggest that an individual eruption may cause a global cooling of up to 0.3C, with the effects lasting 1 to 2 years. Such a cooling event has been observed in the global temperature record in the aftermath of the eruption of Mount Pinatubo in June 1991. The climate forcing associated with individual eruptions is, however, relatively short-lived compared to the time needed to influence the heat storage of the oceans (Henderson-Sellers & Robinson, 1986). The temperature anomaly due to a single volcanic event is thus unlikely to persist or lead, through feedback effects, to significant long-term climatic changes. Major eruptions have been relatively infrequent this century, so the long-term influence has been slight. The possibility that large eruptions might, during historical and prehistorical times, have occurred with greater frequency, generating long-term cooling, cannot, however, be dismissed. In order to investigate this possibility, long, complete and well-dated records of past volcanic activity are needed. One of the earliest and most comprehensive series is the Dust Veil Index (DVI) of Lamb (1970), which includes eruptions from 1500 to 1900. When combined with series of acidity measurements in ice cores (due to the presence of sulphuric acid aerosols), they can provide valuable indicators of past eruptions. Using these indicators, a statistical association between volcanic activity and global temperatures during the past millennia has been found (Hammer et al., 1980). Episodes of relatively high volcanic activity (1250 to 1500 and 1550 to 1700) occur within the period known as the Little Ice Age, whilst the Medieval Warm Period (1100 to 1250) can be linked with a period of lower activity. Bryson (1989) has suggested a link between longer time scale volcanic variations and the climate fluctuations of the Holocene (last 10,000 years). However, whilst empirical information about temperature changes and volcanic eruptions remains limited, this, and other suggested associations discussed above, must again remain speculative. Volcanic activity has the ability to affect global climate on still longer time scales. Over periods of millions or even tens of millions of years, increased volcanic activity can emit enormous volumes of greenhouse gases, with the potential of substantial global warming (Pickering & Owen, 1994; Rampino & Volk, 1988). However, the global cooling effects of sulphur dioxide emissions (Officer & Drake, 1983) will act to counter the greenhouse warming, and the resultant climate changes remain uncertain. Much will depend upon the nature of volcanic activity. Basaltic outpourings release far less sulphur dioxide and ash, proportionally, than do the more explosive (silicic) eruptions. Albedo is an expression of the ability of surfaces to reflect sunlight (heat from the sun). Light-coloured surfaces return a large part of the sunrays back to the atmosphere (high albedo). Dark surfaces absorb the rays from the sun (low albedo). Ice- and snow-covered areas have high albedo, and an ice-covered Arctic reflects solar radiation which otherwise would be absorbed by the oceans and cause the Earth's surface to heat up. The proportion of the Earth's surface that is covered by snow and ice has a great deal to say for how much of the incoming solar radiation is reflected or absorbed. Low albedo (dark surfaces) leads to higher uptake of energy and, hence, warming. Moreover, when more ice and snow melt, there will be more dark surfaces. This is therefore a self-reinforcing effect. Climate change in the Arctic is consequently important for the development of climate change globally. 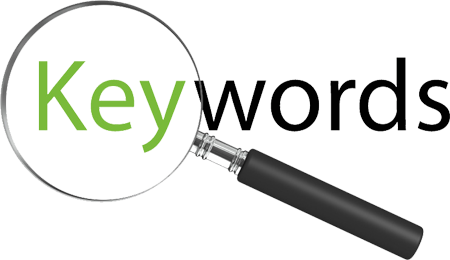 Any change in the environment leading to additional and enhanced changes in that system is the result of a positive feedback mechanism. Alternatively, if a change in the environment leads to a compensating process that mitigates the change it is a negative feedback mechanism. 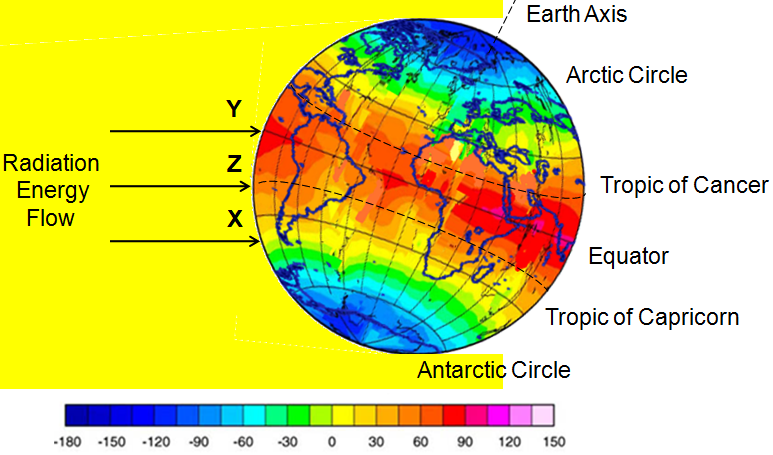 In climate change discussions the focus is on the atmospheric radiation field as a forcing of the climate system (radiative forcing). Currently the discussion concentrate on the radiative forcing associated with the steadily increasing concentrations of different gases in the atmosphere - the so-called greenhouse gases : CO2, CH4, N2O, CFC-gases etc. Other changes in the environment can also lead to changes in the radiative budget, like deforestation, changes in land use and air pollution (ozone, SO4-aerosols, CONTRAILS, É). Also non-anthropogenic changes are important in disturbing the radiative balance: fluctuations in the Solar output and volcanic activity. State the proportion of insolation which (a) is absorbed by the earth’s surface, (b) is absorbed by the atmosphere, and (c) is lost to space. Explain the significance of the shift in wavelength of the sun’s radiation when it is reflected from the earth’s surface. Explain why the equator receives more energy from the sun than the poles. How is this heat surplus dispersed? What is meant by the term ‘radiative forcing’, and what is the difference between ‘positive forcing’ and ‘negative forcing’? What is meant by the term ‘forcing agent’, and what is the difference between an ‘external forcing agent’ and an ‘internal forcing agent’? What is the ‘solar constant’? ​List the reasons that solar variability occurs. Why do changes in the Earth’s orbit cause changes to insolation? What are sunspots, and how do they affect the earth’s climate? 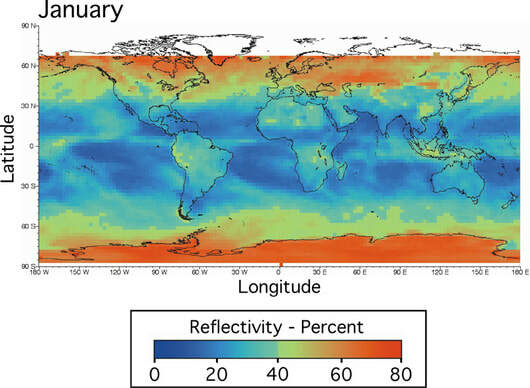 What is global dimming, and what is the role of volcanic eruptions in causing it? Explain how a change in climate could trigger a feedback loop that works through changes to albedo if it occurs near the North Pole or South Pole. Explain why this same feedback loop would be found in a high mountainous area. What is meant by the term ‘amplifying feedback loop’? Provide an example of an amplifying feedback loop that does not rely on an increased surface area of snow or ice. What is meant by the term ‘greenhouse gas’? What is the relationship between greenhouse gases and global warming? List the most significant greenhouse gases that occur naturally in descending order of their significance. The disruption to Earth’s climate equilibrium caused by the increased concentrations of greenhouse gases has led to an increase in the global average surface temperatures. This process is called the enhanced greenhouse effect. While scientists agree that the levels of greenhouse gases and average global temperatures are rising, there is less certainty about what the future consequences will be. To help understand this, scientists use mathematical models. These models take account of many processes that together determine the behaviour of the atmosphere (eg, temperature, humidity, wind speed and atmospheric pressure). The models indicate Earth’s surface will get warmer. This will have serious knock-on effects, such as changes in global rainfall, ocean circulation and extreme weather events, and an increase in sea level. These changes will have further consequences for global agriculture, biodiversity and human health. Putting a precise timeframe upon Earth’s responses to the increased levels of greenhouse gases in the atmosphere is difficult, but it’s clear that recent observations are starting to confirm the predictions of a warming planet. Average global temperature has risen by around 0.7°C since the early 20th century. This may not sound like much, but some regions will experience a much more extreme response than the global average. More importantly, even a small but permanent increase in temperature can have a significant impact upon large scale environmental features like ice sheets or forest cover in the long run. Extreme events, which already push the boundaries of ecosystems’ tolerance, will push even harder. Arctic ice extent, snow cover and glacier volumes have decreased and sea level is rising. Surface ocean temperatures have increased. Warmer ocean temperatures will affect marine ecosystems and can place stress upon coral reefs. Furthermore, the increased CO2 in the atmosphere has also led to an increase of CO2 absorbed by the ocean. This has changed the chemistry of the surface ocean, a process known as ocean acidification, and it can lead to a whole host of other problems for marine life. ​List and briefly describe the ways that human actions contribute to the enhanced greenhouse effect. Describe and account for the broad world pattern of anthropogenic greenhouse emissions shown. Describe the relationship between greenhouse gas emissions and economic development (or national wealth). 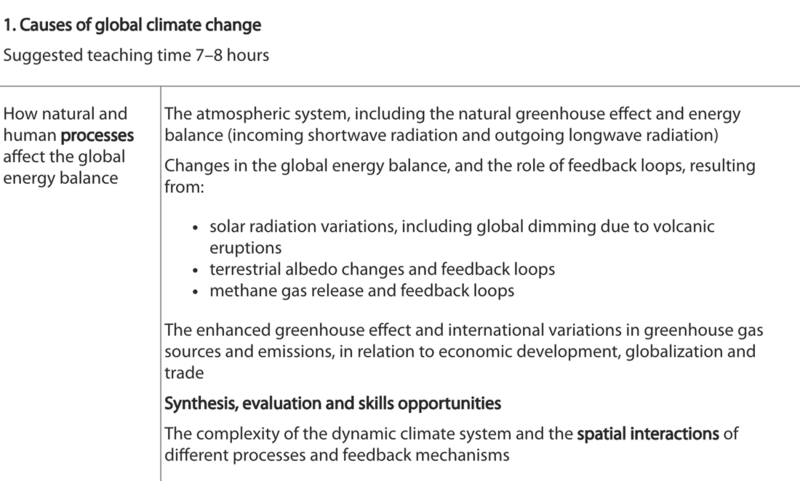 How do globalisation and trade contribute to the enhanced greenhouse effect?